There’s been much speculation recently that Google is planning to overhaul the gaming infrastructure available to Android devices using Google services, now it looks like there’s fire to that smoke. Speculation has been fueled in the past few weeks by the discovery of real-time multiplayer code discovered in the Google Glass APK, followed quickly by Google’s hiring of Noah Falstein as Chief Game Designer. Adding fuel to the fire, we’ve just recevied the above image from a tipster who says it landed in his mailbox today. Besides reinventing the (specifically-capitalised) Playground, use of the tagline “Let’s play together” also calls to mind multiplayer gaming. It looks certain Google intends to announce something gaming-related next Wednesday (Thursday morning, Australian time) during the Day 1 Keynote at Google I/O on May 15. Are you excited by Google’s renewed focus on Android gaming? Let us know in the comments! I don’t think the Play Services were mistakenly left in. I think there is a new version of INGRESS the game, which would supply the UI. What better for a game that interacts with the real world and than Google Glass. Look for a Google I/O new Ingress game that supports Google Glass !!! Anybody know what time AEST the event it? Is it the time where I will wake up to it on the 16th here? I really hope it is a gaming centre, I missed that coming from iOS. I really like the name Playground, it’s a simple extension to the Google Play app store, but says everything it needs to, all in one word. The big Android is so blurry it seems intentional … but then that seems kinda weird for them to do that. 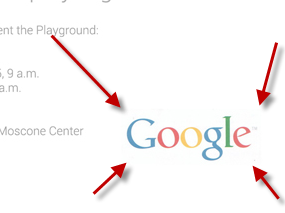 There is indeed a lot of crap behind the Google logo. Jason tipped us, though I do indeed follow Ausdroid as well. I think it’s good to be skeptical about it. The blurriness I took as JPG artifacting from a compressed screen grab, which can also explain the crap behind the logo – I see images with that effect every day. I actually should have posted this under Rumours rather than News. I think if google is going to address this, perhaps they are working on a social game hub? Something that intogrates with google plus and shares scores and what not together?